The Grammar of "It Was Meant to Be"
A guru tutors a group that meets regularly in his apartment in the Language of the Universe, in which Donald Trump is an adjective. When E, the narrator of this debut novel, was unsettled by a general confusion about the world, a friend of his father’s recommended that he join a discussion led by Z, hosted in his apartment. The book is a record of those meetings, each chapter dated like a journal entry, which last from the time of Trump’s election to his inauguration and presidency. Once E’s narration has begun, he’s belonged to the group for a touch over a year, and each of the six participants is assigned letters in place of names, running from A to F. Z leads each meeting, impatiently slinging cryptic lessons at his interlocutors, who struggle to decipher their meaning. The exchanges revolve around the Language of the Universe, which Z insists is communicated through events. 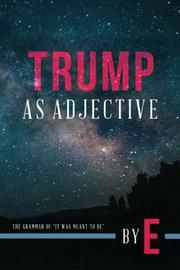 Z accurately predicted the election of Trump, whose ascendancy corresponded with the global melting of ice and who functions as an adjective in the Language of the Universe. The group listens in rapt awe as Z expounds on the nature of that language, which is obscured by humans’ obsession with logic and science, rarely finding cause to challenge the guru’s obscure ramblings. There is often an intramural controversy regarding how many members the band can sustain—there are only so many seats—and there is finally something of a mutiny against Z when he demands that a prospective candidate, a woman renamed Y, strip for the group. Author E, writing under a nom de plume, ambitiously eschews the typical conventions of novels: there is virtually no plot, almost no character development, and Z’s views, which are the book’s centerpiece, are incomprehensible. But Z can be genuinely funny, even if it remains unclear whether or not that is his intention. Z is memorably eccentric and mercurial and, at his best, is manically imaginative as well as impossibly confident in his insane pronouncements (“Eating the apple from the Tree of Knowledge meant getting knowledge one bite at a time, one apple at a time, from many trees, in many orchards”). Problematically, Z’s nonsensical assertions grow tedious, and the reader becomes bewildered as to why the crew is so impressed by his impenetrable babbling. The reader is necessarily left rudderless, unable to determine whether or not Z should be taken seriously and, if so, on what grounds. The tale’s narrator seems levelheaded but also utterly insensitive to the indefensibility of Z’s worldview, to the extent that a coherent one can be fashioned from his teachings. In addition, much of the story dwells on the group’s petty disputes, made less gripping by the fact that the players are no more than ciphers bereft of substantive history or personality. Of course, E’s creation is an inventive one, but novelty is a dubious literary virtue when not attached to relatable, well-constructed characters and an intelligible plot. Ultimately, the work as a whole becomes pointless, and the fact that this might be the author’s aim is a meager consolation. A laboriously inscrutable novel about the teachings of a mysterious figure.